If you’re searching for the best acne spot treatment, look no further. We’ve saved you the trouble of doing hours of internet research and condensed the most helpful information into one article (with sources, of course, if you actually kind of enjoy the research part). Spot treatment products for acne are some of the most popular, because acne always seems to appear at the worst possible moments. Right before a big date, the night before an important presentation, basically any time you know people will be paying close attention to you and your appearance. But even the best acne spot treatment won’t clear your skin entirely. Your acne will see the most improvement through a gentle, consistent skincare routine. The best acne spot treatments can help reduce the visibility of a frustrating acne breakout. Still, acne can sneak up on all of us. Luckily, there are some powerful spot treatments available at the drug store or even in your own pantry, but be careful. Some spot treatments are far too harsh and could actually make acne worse. This article will explain what causes different kinds of acne so you’ll know how to best treat them, warn you about the harmful treatment options, provide a handy guide for finding the best acne spot treatment for every situation, and give you some fun do-it-yourself spot treatment ideas. Acne is caused by a combination of inflammation, bacteria, and excess sebum (natural skin oil), and the different kinds of acne are caused by different combinations of these factors. The best way to fight acne is to understand it, so let’s review the four major kinds of acne: blackheads and whiteheads, papules, pustules, and cysts. Blackheads and Whiteheads: We grouped these two together because they are incredibly similar. Both are caused by sebum and dead skin cells getting clogged in a pore, but with blackheads, the pore remains open to the air, and with whiteheads, the pore is closed. Contrary to popular belief, blackheads are not caused by dirt. It’s the exposure to air that turns them a darker color. Rest assured, even the cleanest person in the world can get blackheads. Papules: This form of acne occurs when the skin becomes slightly inflamed and traps sebum and acne-causing bacteria beneath the surface. Papules are raised bumps, sometimes painful or white in color, but they do not have a defined head. Pustules: More commonly referred to as pimples, pustules are raised bumps with a white or yellow-ish color and a clear head. They are similar to papules because they are also caused by inflammation trapping bacteria and sebum, but pimples form when the immune system has successfully fought off the bacteria. Cysts: Although the immune system can often fight off acne-causing bacteria, sometimes it gets fooled. The bacteria can release a chemical that attaches to your skin and tricks the immune system into attacking you rather than the bacteria. This allows the infection to grow and create a cyst, a large raised bump without a defined head. This kind of acne is typically considered more severe and will likely not benefit from spot treatment. Even though everything we read warns us against the evil of pimple popping, when we get a surprise breakout, we just want to pop it and make it go away. Even though popping pimples is not as awful as some sources make it sound, it’s usually not the best option. There are two main reasons you should avoid popping your pimples when possible: bacteria and scarring. The bacteria problem is a two way street: there are bacteria on your hands that could enter your pimple and make it worse, and there are bacteria inside the pimple that are released after popping and could spread to other areas of the face. Scarring is another big issue with pimple popping. To release the pus inside a pimple, you must break the skin, which can leave a scar or dark spot. Does this mean you can never ever pop a pimple? No, we don’t think so. But there are very specific guidelines you should follow if you do choose to pop. First, if the pimple does not have a defined, white or yellow head, do not pop it. If there’s no defined head, you will have to break the skin significantly in order to pop it. This can lead to serious scarring. Second, make sure you wash your hands and face before popping. This will help reduce any concerns about bacteria. Third, if you have long nails, trim them or be very careful to use only the pads of your fingertips. Using your nails could break the skin more than necessary and lead to scarring. Fourth, stop popping immediately if you see clear liquid or blood, even if you know there’s more pimple to be popped. Finally, wash your hands and face again after popping to help prevent the spread of bacteria. It’s a common myth that “if it stings, it’s working.” In most cases, it’s actually the opposite. Acne treatment products should not hurt, burn, sting, or tingle. Although these sensations may mean the product is effectively breaking up the clogs in pores and killing bacteria, if you are experiencing discomfort, it is probably hurting your skin as well. It may seem obvious that if you want to treat your skin, you shouldn’t hurt it in the process, but many people are willing to hurt their skin just a little if it helps get rid of the acne. The problem is, hurting your skin almost always leads to more acne. When your skin is irritated, it finds ways to protect itself from the irritant. Primarily, it releases more sebum and triggers a minor inflammation response, both of which can contribute to acne. This is why especially drying products can work super well at first, then produce more acne later on. They dry out the oil causing the acne, then they dry out the skin so much they force it to create extra oil, which gets trapped in pores more easily because the skin is inflamed from being dried and irritated. This is true for full-face acne products and for acne spot treatments. Although spot treatments can be stronger than products you would use all over, they still shouldn’t damage your skin. To avoid stinging, tingling, and burning, and all the skin irritation they signify, don’t use spot treatments with ingredients like alcohol, menthol, or peppermint. Walking down the acne spot treatment aisle at the drug store can be dizzying; there are so many options, how are you supposed to choose? The most important factor in deciding the best acne spot treatment for your situation is timing. How quickly do you need to see improvement, and how long does it need to last? It’s important to remember that even the best acne spot treatment has limitations, so we made this handy guide. If you’re on a time crunch, the best acne spot treatment is one that focuses primarily on inflammation rather than sebum or bacteria. Using a treatment that soothes the skin and reduces inflammation will make the acne less raised so it stands out less, and it will help get rid of redness and pain. One way to bring down redness and inflammation quickly is surprisingly simple: ice. Just place one ice cube in a Ziploc bag and gently press to the affected area. Be careful not to push too hard, as this could irritate the skin and cancel out the positive effects of the ice. Let it sit for 5 to 10 minutes, or until the area goes numb, whichever comes first, then remove the ice. You can repeat this process once per hour for the best results. Some spot treatments work faster than others, but the best treatment is gentle, long-term skincare. 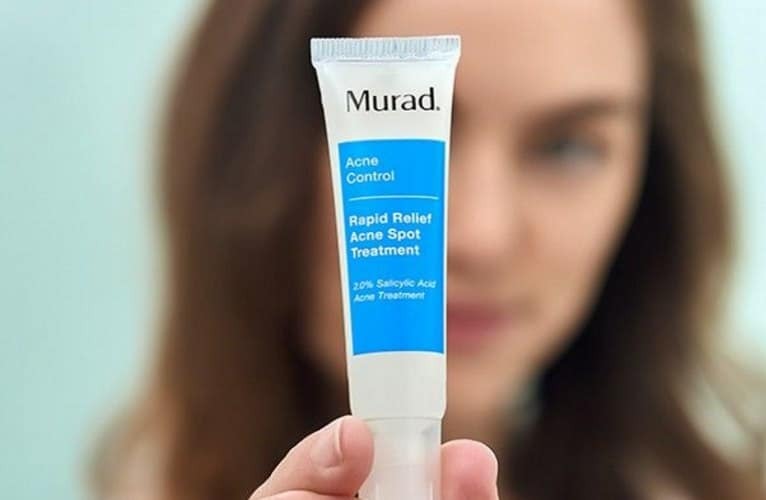 When it comes to over-the-counter products, one we can recommend is Murad’s Rapid Relief Acne Spot Treatment. It claims to improve acne within four hours, although that was determined by a Murad-sponsored study, so you may want to take it with a grain of salt. Still, it has many positive reviews that indicate those results may actually be accurate. This product uses salicylic acid, a chemical typically used in acne products to help exfoliate the skin. This helps new, healthy skin cells grow, which reduces inflammation and redness, especially when combined with Murad’s natural ingredients like horse chestnut and thyme. Have you ever treated your acne in the morning, felt satisfied with your skin’s appearance, only to go to the restroom halfway through the day and see that it had become red and inflamed all over again? If you have a long day ahead of you, the best acne spot treatment needs to keep up with you. One solution you can probably find in your medicine cabinet is ibuprofen. This and other pain killers have anti-inflammatory properties that can make acne less visible It doesn’t work immediately because it has to be absorbed through your digestive system into your bloodstream, but it’s this very process that helps keep redness down throughout your day. We recommend taking the appropriate dosage then using the ice method before leaving for school/work/etc., that way you have some immediate results, and long-lasting protection. Note: Some medications or medical conditions are not conducive with ibuprofen or other anti-inflammatory medications. Always follow dosage directions and contact your doctor if you aren’t sure if ibuprofen is right for you. The longest-lasting acne results come from using a reliable acne treatment system every day. 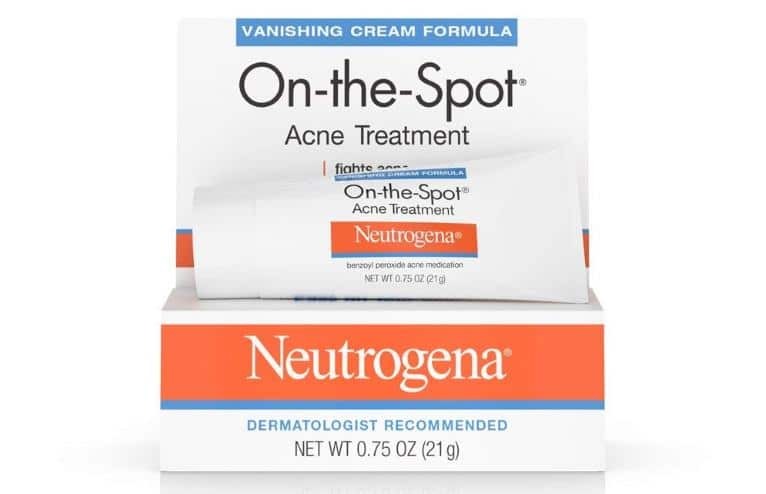 An over-the-counter product that is worth a try if you need something to get you through your whole day is Neutrogena’s On-the-Spot Acne Treatment. This product uses benzoyl peroxide like many other over-the-counter spot treatments, but this one uses a safe concentration, at just 2.5%. This is the typical number for an all-over treatment, so unless your skin is especially dry or sensitive, it shouldn’t irritate the skin or add to further breakouts. The benzoyl peroxide stays on your skin all day, keeping your acne from flaring up and catching you unawares. The only downside to benzoyl peroxide products is that they tend to make the area redder initially, so you’ll want to apply this spot treatment as soon as possible in the morning, so your skin has time to return to a normal color. Sometimes our acne will give us a word of warning: maybe you know that when a particular spot gets tender or red, a pimple is brewing beneath, or a fully formed pimple might arise the night before a big meeting. Either way, this is the best case scenario for spot treatment. Acne treatment doesn’t happen overnight, but letting the treatment work for 8 hours while you sleep is better than giving it only 20 minutes before you dash out the door. However, this huge advantage can also be a pitfall. Whatever spot treatment you use will remain on your face all night, so you don’t want it to be too harsh. For example, although pure tea tree oil is a great do-it-yourself spot treatment (see more below) it shouldn’t stay on your skin for more than 20 minutes, as it can be incredibly drying. Instead, we recommend trying the ibuprofen trick or trying Exposed Skincare. If you take an ibuprofen before bed, you could prevent the acne from becoming inflamed in the first place, and you should be able to take another in the morning, to continue preventing the inflammation. Just be sure you aren’t taking more than the recommended dosage. Exposed Skincare’s Acne Treatment Serum is just one step in their three-step acne treatment system that can prevent last minute breakouts. If you have time to treat acne overnight, the best acne spot treatment that you can find over-the-counter is Exposed Skincare’s Acne Treatment Serum. This product contains benzoyl peroxide, green tea extract, and small amounts of tea tree oil. Exposed is well known for how they combine scientific and natural active ingredients to treat acne while keeping your skin healthy. Because this spot treatment uses green tea extract, which heals and soothes skin, it can use small amounts of tea tree oil and a higher concentration of benzoyl peroxide (3.5%) without harming skin. Although you won’t see instant results, it can be a significant help if you catch a breakout early, and it becomes even more effective when used with the full Exposed Skincare treatment system. There are countless reasons to try do-it-yourself skincare: it’s cheap, it’s fun, and it works! Granted, no DIY treatment works as effectively as a full skincare system, but some of the best acne spot treatments are made from items you can find in your kitchen. Below are three of our favorite DIY recipes to get rid of surprise breakouts quickly. This is the best acne spot treatment for pimples because the aloe vera soothes the skin to reduce inflammation, and the tea tree oil kills acne-causing bacteria to prevent the pimple from getting worse. The coconut oil serves as a carrier oil that helps dilute the tea tree oil and spread it evenly throughout the mixture. This recipe should work for most skin types, but if you have especially sensitive skin, you might want to try our green tea ice cube recipe. Additionally, this should always be rinsed off before leaving the house. Leaving the mixture on too long can be drying, and tea tree oil can make the skin especially susceptible to sun damage. Combine ingredients in a container with a lid, as this recipe will make enough for multiple uses. First, wash your face with a gentle facewash and pat dry. Using your finger or a cotton ball, apply a small amount of the mixture to the affected area. Let the spot treatment sit for 10-20 minutes, then rinse and pat dry. We love to recommend honey, because we’re convinced there’s nothing it can’t do. It is especially useful for acne because of its antimicrobial, anti-inflammatory, and wound healing properties. Acne is technically a minor wound, meaning it can benefit from many of the properties in honey that make it so effective that doctors today still use dressings infused with honey. To create the best acne spot treatment possible, this recipe combines honey with lemon juice, a lightening agent that can help reduce redness. However, if you have dark skin, you may want to use pure honey or try a recipe combining honey and cinnamon instead, as lemon has been known to discolor dark skin. Combine ingredients in a container with a lid, since this mixture will likely make enough for multiple uses. Before going to sleep, wash your face with a gentle facewash, pat dry, and apply the mixture to the affected area. You may want to place a tissue over the area to keep your pillowcase and bed sheets from getting sticky, but do not use a bandaid or any other product that could cut off air. This could clog pores. In the morning, rinse with a gentle facewash and cool water, then pat dry. We were so excited to find this idea, because it combines two classic anti-inflammatory agents in a unique way. Ice naturally brings down swelling, and green tea extract reduces redness and inflammation, so together they are one of the best acne spot treatments that you can make at home. This recipe is gentle enough to work for all skin types, and it is probably most effective with pimples or other inflamed acne, rather than blackheads or whiteheads. First, heat the water in a stove pot or microwave-safe container. When the water is about to boil, but not yet boiling, remove from heat. Next, place the green tea bag in the mug, and pour the hot water into the mug. Then let it sit and cool for an hour or until cool. If you were drinking the tea, you would only let it steep for 3 minutes or so, but since flavor doesn’t matter, the tea bag can stay in the mug. Once the tea is cool, pour it into the ice cube tray and freeze for several hours. Once frozen, hold the green tea ice cube directly to the affected area. Do not place it in a Ziploc bag first, like with the traditional ice cube method, because you won’t get the benefits of the green tea. Apply for 5 minutes, or until the skin is numb, then throw away the ice cube. Do not reuse ice cubes, as they could be carrying bacteria from your skin. Even though there are a wide variety of spot treatment options, the best way to treat acne is to prevent it through a gentle, consistent skincare routine. You don’t want to use anything too harsh, even if it might get rid of acne quicker, because it will also dry out your skin, causing irritation and leading to more acne in the long run. Instead, opt for a system like Exposed Skincare. It combines scientific active ingredients like benzoyl peroxide and salicylic acid with natural active ingredients, like green tea extract, aloe vera, and tea tree oil to give you the best results without irritating your skin.